Beaten by colleague Miyu Kato in the final in April in Slovenia, in the third round of the Women’s Singles event at the 2018 ITTF Challenge Belgosstrakh Belarus Open in Minsk, Japan’s Sakura Mori extracted revenge on the afternoon of Saturday 17th November. Total commitment as always, never slow to show her feelings, the no.19 seed, she beat her earlier nemesis, the no.4 seed, in a dramatic seven games duel determined by the very minimal margin in the seventh game (11-9, 11-5, 8-11, 6-11, 7-11, 11-7, 12-10). Success against the odds for Sakura Mori but it was not the biggest upset of the round; that privilege belonged to Russia’s Maria Dolgikh, required to compete in the two day qualification tournament, she used her defensive skills to good effect to beat Canada’s Zhang Mo, the top seed (5-11, 11-9, 11-6, 11-7, 11-6). Defeats contrary to predictions, there were more; in the contest between players over four decades apart, 14 year old Miyuu Kihara, the no.15 seed accounted for Luxembourg’s 55 years of age, Ni Xia Lian, the no.7 seed (11-5, 11-5, 11-6, 11-9). Conversely for Japan, Satsuki Odo, the no.8 seed, experienced defeat at the hands of Slovakia’s Barbora Balazova, the no.11 seed, in a full distance contest (7-11, 8-11, 11-7, 12-10, 6-11, 11-6, 11-8). Progress for Barbora Balazova in a closely fought encounter, it was the same for Polina Mikhailova, the no.6 seed; in an all-Russian duel, she eventually overcame Yana Noskova, the no.12 seed (6-11, 3-11, 11-7, 11-5, 4-11, 11-6, 11-9). A hard fought win for the higher rated player, it was the same for Chinese Taipei’s Chen Szu-Yu alongside Japan’s Saki Shibata and Minami Ando. Notably all repeated earlier successes. 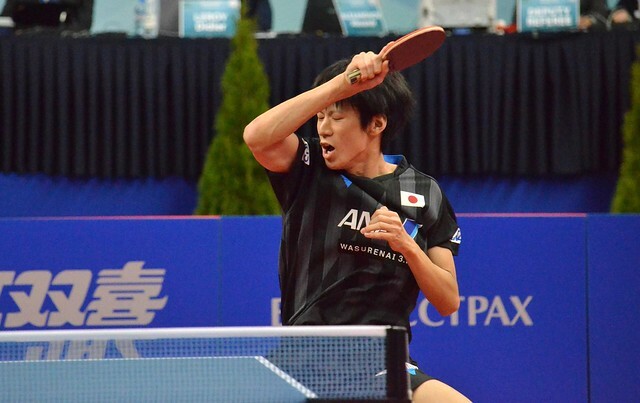 Chen Szu-Yu, the no.3 seed, who had beaten Japan’s Maki Shiomi, the no.14 seed in Minsk in the opening round two years ago at the 2016 ITTF World Tour Qatar Open, once again she prevailed. She recorded a six games win (8-11, 11-6, 11-5, 11-8, 9-11, 13-11). Likewise, Minami Ando, the no.5 seed, replicated her success of just one week earlier in the first round at the Seamaster 2018 ITTF World Tour Austrian Open in Linz; once against she prevailed in opposition to the Czech Republic’s Hanna Matelova, in Belarus the no.10 seed (11-8, 11-8, 6-11, 11-3, 11-5). Similarly, Saki Shibata, the no.2 seed, ended the hopes of Ukraine’s Ganna Gaponova, the no.9 (11-8, 8-11, 8-11, 11-4, 11-3, 11-5); earlier this year they had met in the same round in Croatia, a good omen for Saki Shibata, on that occasion she had progressed to win the title! At the quarter-final stage Maria Dolgikh meets Miyuu Kihara, Polina Mikhailova faces Sakura Mori; in the opposite half of the draw Chen Szu-Yu plays Minami Ando, Barbora Balazova confronts Saki Shibata.